In the very heart of the Grand Valley, this gray-gabled charmer is almost equal distance from Palisade’s wine tasting, as it is to Fruita’s world-class mountain biking. This home is minutes from CMU, Lincoln Park, the award-winning Redlands Mesa golf course, the Tabaguache Trail system, the botanical gardens, and a walk away from the Mesa County Public Library, Two Rivers Convention Center, two parks, the historic Avalon Theater, and several churches. Beautiful Downtown Grand Junction is a four-block walk, featuring the farmer’s market (June-Sept), abundant sculptures, several local dining hot-spots, unique shops, gelato, and several other events year-round. This remodeled home boasts original hardwood floors, all the original woodwork, a quaint parlor which can be used as a second living area, third sleeping area, or office, a cozy porch complete with a porch swing, and two townie bikes with locks! It can sleep up to six people, and appeals to both adults and families alike. It includes a fully stocked kitchen, washer and dryer, ceiling fans, a queen, king, and sofa sleeper, and a fully stocked bathroom with toiletries and hairdryer. The home is kid-friendly - includes a pack-n-play, outlet covers (available to use if needed), high chair, and kids plates/utensils. For grown-up kids, there are books, Netflix instant service, three flat-screen TVs, board games, and high-speed internet. Relax in the ambient back yard, which features a pergola with lights, chiminea, barbecue grill, and has kids toys, a sandbox, abundant seating, and a shed (to store bikes and recreational equipment if needed). Keyless entry provides ease of checking in, and a comprehensive handbook provides abundant information about local resources to enhance your stay. Last-minute discount may be available – contact the owner for details. Whether you’re visiting to ski, hike, or ride the Grand Mesa, largest flat-top mountain in the world, hike, ride, or drive the beautiful Colorado National Monument, wine taste, mountain bike, for a CMU event, JUCO, or whatever brings you to the Grand Valley, this home is in the heart of it all! George and Tara Gatseos own Over the Edge Sports in Fruita, have a background in real estate, and help run the Fruita Guide company, Fruita Fat Tire Festival, and Tour of the Vineyards, as well as manage other rental properties. George is an avid mountain bike rider, and Tara’s background is in music, organizing, and teaching. They have been actively involved in the community for many years, Tara having been born and raised here, and George living here for the last 20 years. They LOVE calling Grand Junction home – from the weather and climate, to the size, to the recreational opportunities, they enjoy raising their family in such an ideal place! As avid vacation renters themselves, George and Tara have learned what guests need and want in a vacation rental. 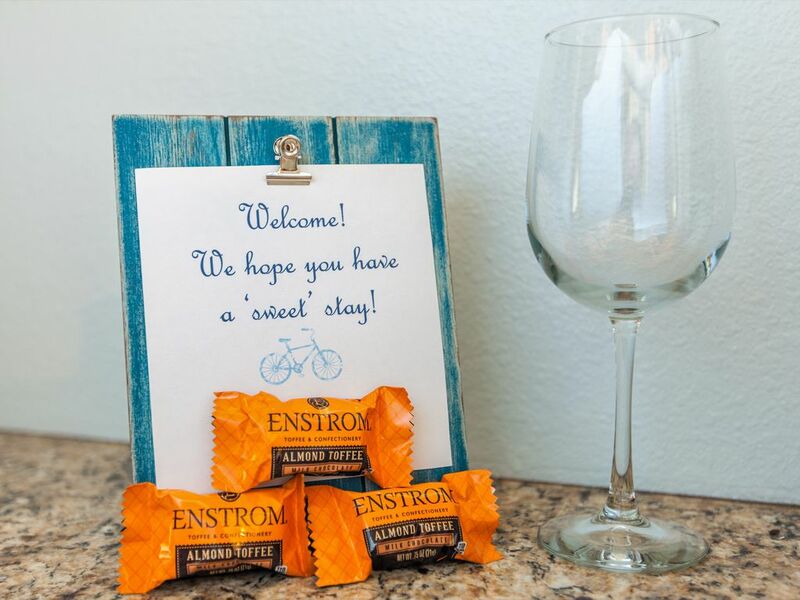 They’ve tried to ‘think of everything’ to make your stay as smooth and enjoyable as possible. They always welcome constructive feedback and suggestions of how to improve your stay, so don’t hesitate to contact them! They sincerely hope you enjoy your stay at Gray Gables! We have tried to think of every detail, to make your stay as enjoyable and smooth as possible. Fun, Victorian-inspired decor with a spa-like feel, the high ceilings and abundant natural sunlight make it feel large and spacious. We're a three block walk to downtown Grand Junction! Yes, with extras if needed. Plenty of street parking, as the house is on a corner, as well as a curb-cut on the west side of the house. We can make available a small one-car garage if needed. Contact us for details. It does not have a garage door, but will protect from the elements. It is accessed from the alley. Luxuriously soft towels and washcloths provided. Comfortable and 'homey', with lots of seating and lighting. We have abundant dishes, utensils, and serve-ware. Fully stocked with anything you should need. If we don't have something you need, let us know and we'll get it! Seats 5 comfortably, 6-7 if children and/or add chair on end of table. Outside table seats 6. Ladies schwinn cruiser bike and men's cool old mountain bike. Lincoln Park Golf Course and the award-winning Redlands Mesa golf course are both a 5 minute or less drive away. 1st Choice to Stay in Grand Junction !! Great town!! Great house - everything you need - clean & comfortable and close to everything Grand Junction has to offer! We enjoyed our stay to Grand Junction and loved the convenient location of the house. It was fixed up very nicely and had everything we needed. I was pleasantly surprised to find both coffee and creamer there as I forgot to buy these. The house is charming and fixed up beautifully. The owners were great and checked up on us upon arrival via text. Thank you Jasmine! We enjoyed having you! Beautiful, very well appointed home! Very clean and professionally decorated home within walking distance to downtown. Great location! Clean, comfortable, close to everything we wanted to do. Very cute place. We really enjoyed our stay! The house was very clean, comfortable, quiet, and close to everything. Will definitely stay here again! See our detailed handbook at the house, when you stay!